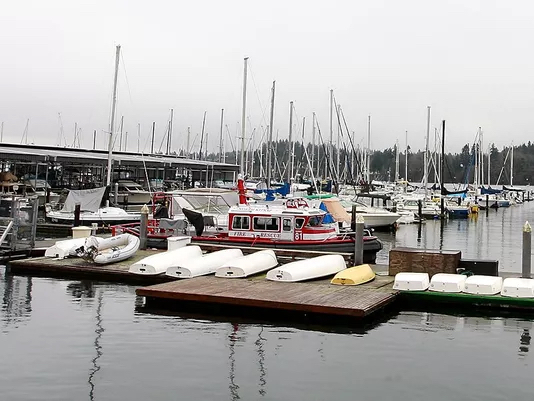 For at least a year, officials have considered the success of new sewage-pump-out stations for boats, Berbells said, and it is now easier than ever for boaters to offload wastes from their holding tanks and toilets. New data on the usage of pump-out stations and the volumes of sewage collected lends support for the smaller shellfish-closure areas around marinas. The decisive step in the process was the final approval of a no-discharge zone throughout Puget Sound, effective in April of this year. The no-discharge zone makes it illegal for boaters to dump sewage — even that treated with chemicals — anywhere in Puget Sound. State officials use a mathematical model to determine the size of shellfish-closure areas around marinas. The model considers the depth of the water and currents around marinas as well the number of boats and various other factors. The model was applied to each marina to come up with new closure areas. In all, 385 acres near the marinas will be moved into an “approved” classification, meaning commercial shellfish harvesting can proceed quickly. Another 276 acres will be listed as “unclassified,” meaning that the owner will need to apply before harvesting shellfish. An application opens the door to further water-quality tests before the harvesters are given the green light. Kitsap County, with six marinas, will see the most total area — 228 acres — shift into the harvestable category. The marinas are Blake Island, Brownsville, Kingston, Keyport, Liberty Bay and Poulsbo. Jefferson County, also with six marinas, will experience the second largest total area available for harvest with 144 acres. 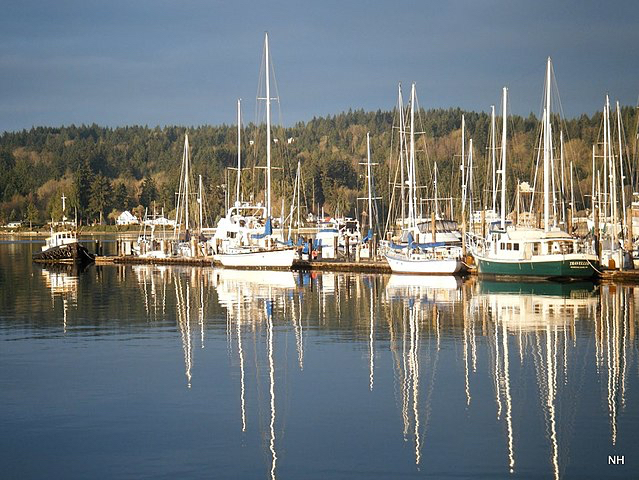 Marinas are Cape George, Fisherman Harbor, Pleasant Harbor, Port Hudson, Port Townsend and Quilcene. Other counties benefitting from upgrades are Thurston with Boston Harbor and Zittels marinas, 104 acres; Clallam with John Wayne Marina, 67 acres; Mason with Hood Canal and Jarrel Cove marinas, 43 acres; Pierce with Day Island Marina, 43 acres; Whatcom with Birch Bay Marina, 27 acres; and Island with Sandy Hook Marina, 5 acres. In 2007, Puget Sound Partnership established a goal, called a “target,” of upgrading 10,800 acres of shellfish beds by the year 2020. The objective was to increase general water quality throughout Puget Sound while allowing increased shellfish consumption, both from commercial and recreational harvesting. Progress is being made, according to a status report by the Puget Sound Partnership, which considers it possible to meet that goal, if not by 2020 then soon after. Since 2007, a net increase of 5,632 acres have been upgraded, according to the latest figures from the Department of Health. That includes a subtraction of acres for areas that have been downgraded. A major downgrade of about 4,000 acres in Samish Bay in 2011 substantially hindered progress toward the 10,800-acre goal. In fact, if the Samish Bay shellfish beds could be restored to a safe state for harvesting, Puget Sound would be on the doorstep of meeting the 2020 goal. That’s why state and local officials are working diligently to identify and eliminate the sources of pollution coming into Samish Bay. Meanwhile, work continues on upgrading other shellfish beds throughout Puget Sound. This year alone, 350 acres of shellfish beds in Oakland Bay in Mason County were cleaned up to meet health standards, along with 129 acres in Birch Bay in Whatcom County. In addition, 86 acres were upgraded with the construction of a new wastewater treatment plant in Port Gamble Bay in North Kitsap, where a sewage drainfield has replaced discharge into Hood Canal. Still, the battle against pollution goes on. For example, a 101-acre portion of Burley Lagoon on the border between Kitsap and Pierce counties was downgraded this year, as well as 65 acres near the mouth of Chico Creek in Kitsap County’s Dyes Inlet.